April 6, 100 block of South Bay Boulevard, warning. 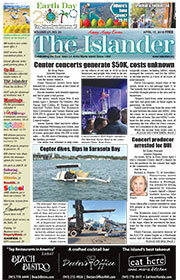 A man was reported standing on a construction barge about 50 yards off the beach at the Anna Maria City Pier. He returned to shore and met his mother, who was in the construction parking lot. Both were warned that they were trespassing. They said they were visiting from England and staying in Clermont. April 6, 2000 Gulf Drive S., Coquina Beach parking lot, criminal mischief. A woman reported someone scratched her car and wrote derogatory words on it between 1 p.m. and 7:45 p.m., while she was with her family at the beach. A mirror also was cracked. April 7, 2000 Gulf Drive S., Coquina Beach parking lot, operating a vehicle with a suspended license. A man approached a Bradenton Beach police officer to report being followed and harassed by a man over several days. The man he accused of harassment was pointed out as he passed by in a vehicle, and the officer followed and ran the vehicle tag, which came back as stolen. The driver was stopped and did not have a valid driver’s license and said the truck was from Indiana and not registered. The Florida tag on the truck was stolen. The man was given a summons for driving on a suspended license and driving an unregistered vehicle. The officer determined the harassment had taken place within the jurisdiction of Longboat Key and referred the complainant to the Longboat Key Police Department. April 7, 2200 Gulf Drive S., Coquina Beach, trespass warning. A woman parked her car on the sand on the beach near the south bathhouse. She told officers she lives in her car and parks there overnight. Manatee County Marine Rescue trespassed the woman from the park. April 8, 500 block of Gulf Drive North, Bridgeport condominiums, property damage. A man reported someone scratched his newly painted front door, placing the damage at $800. March 28, 3900 E. Bay Drive, Publix Super Market, trespassing, possession. Officers were called to a fight in progress and found the store manager had been assaulted. Two white males, one a juvenile, were stopped near the store exit and appeared to be intoxicated. While checking IDs, the juvenile failed to listen to commands and was handcuffed and placed in a patrol car, where he spat on the computer screen and the window cage. He was given a breath test and transported to Manatee County Juvenile Assessment Center. The other male was given a notice for possession of less than 20 grams of marijuana found during a search of his backpack, and taken to Kingfish Boat Ramp. Both were trespassed from Publix. April 5, 700 block of Manatee Avenue, Kingfish Boat Ramp, burglary. A man returned to his locked car after three hours to find his wallet missing. It contained $80 cash, a Florida driver’s license and a debit card. Fingerprints were taken. April 8, 100 block of 73rd Street, Coconuts, fraud. The manager of Coconuts reported a customer left without paying for a three-month stay. She said he was a repeat customer. He promised to mail a check, but no check had arrived. April 8, 4000 Gulf Drive, Manatee Public Beach, burglary. A woman reported her purse stolen from under the front passenger seat of a parked vehicle. April 9, 600 block of Baronet Lane, fraud. A man reported someone opened a Discover card in his name and completed a transaction for $2,856.87 at Best Buy in Sarasota. Another purchase attempt in Hialeah was declined. April 10, 4500 block of Third Avenue, petit theft. A man and a woman riding bicycles stopped at a house and parked the bikes under the carport. When they left the house 45 minutes later, the man’s Shogun Safari bike was missing.